A few weeks ago, we celebrated the festival of hues, Holi. Ideally, it marks the advent of spring, and people paint each other with non-toxic coloured powder (also known as gulal) to celebrate the blossoming of life after a rather gloomy period from autumn to winter. A day before ranpanchami, Hindus observe the tradition of Holika Dahan, where bonfires and pyres are burnt in memory of Holika the sister of Prahalada who saved the boy from the wrath of his father. The legendary story goes like this. With the boon granted, and believing to be invincible, Hiranyakashipu’s reign of terror begins, as he now proclaims himself to god. However his own son, Prahlada, who is an ardent Vishnu worshipper, does not renounce his faith in his god, and claims he is omnipresent. Enraged the father points at a random pillar demanding if his god is behind it, to which the boy nods. 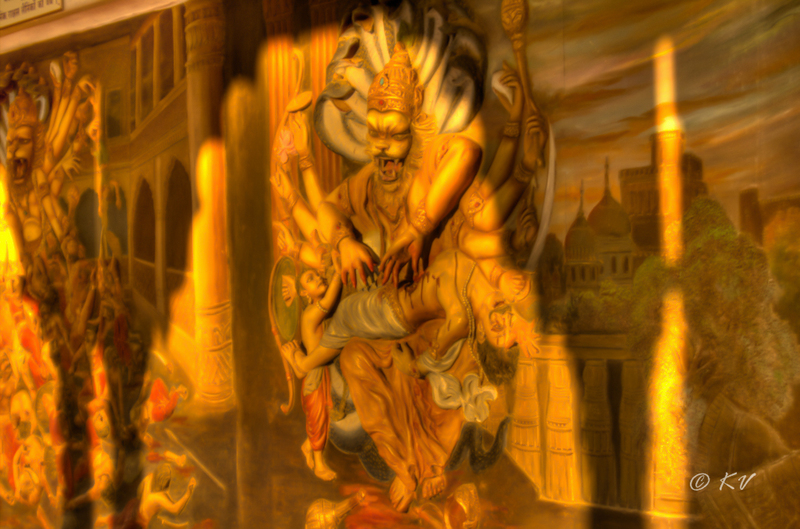 As Hiranyakashipu destroys the pillar with his sword, the fourth incarnation of Vishnu, Narasihma appears (Nara means human, sihma means lion). He appears at dusk, which is neither day nor night, on the doorsteps of his palace which is neither indoors or outdoors. Placing him on his lap (neither on earth or the skies) Narashima tears him opens with his paws, which is a live being or inanimate object. This the boon proves to be ineffective.